Top-Rated Sewer Cleaning In Chelsea MI - Associated Plumbing & Sewer Service, Inc.
For The Leading Sewer Cleaning In Chelsea, There's Associated Plumbing & Sewer Service, Inc.! 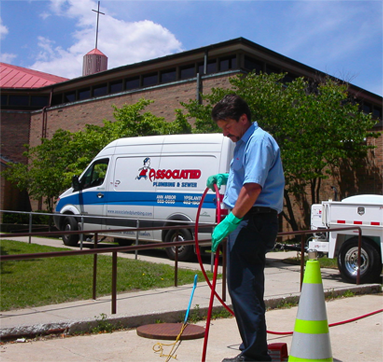 We employ some of the most experienced and skilled sewer cleaning specialists near Chelsea MI. Blocked pipes due to tree roots, or other source, needs to be addressed quickly. Blockages can be dangerous, as the built-up water pressure can lead to bursting pipes. For root intrusions, it is important use a camera to make sure there aren't other issues or more roots in the drain. Our team evaluates your pipes and informs you through each step. Our pricing is transparent, and we show you the estimate before we begin to work. Whether located in the sink, on the floor, or in the toilet, your drains are the closest link between you and your plumbing system. A problem with your drain may be a sign of more extensive plumbing damage, and even if it isn't, fixing the drain quickly is key to preventing more extensive problems. Associated Plumbing & Sewer Service, Inc. offers comprehensive drain cleaning for homeowners throughout Chelsea. Enduring Enhancements - In addition to fixing the problems with your current drain, we can also upgrade the drain to prevent future issues. We also offer common sense tips to reduce the chance that your drain will have problems going forward. If one drain gets clogged or backed up, do the others work normally, or do they develop problems as well? Problems with multiple drains often indicate a broken sewer line, requiring extensive repair efforts. But no matter how complex the repairs, Associated Plumbing & Sewer Service, Inc. will not hesitate to make them.